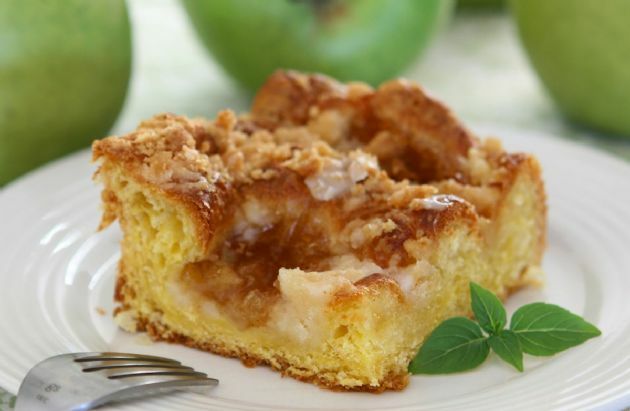 Apples and raisins provide the moistness, which means less oil can be used in this low saturated fat, low cholesterol, and low sodium coffee cake. Apples and raisins provide the moistness, which means less oil can be used in this low saturated fat, low cholesterol, and low sodium coffee cake. 1.Preheat oven to 350º F.
2.Lightly oil a 13x9x2-inch pan. 3.In a large mixing bowl, combine apples with sugar, raisins, and pecans; mix well. Let stand 30 minutes. 4.Stir in oil, vanilla and egg. Sift together flour, soda and cinnamon; stir into apple mixture about 1/3 at a time just enough to moisten dry ingredients. 5.Turn batter into pan. Bake 35 to 40 minutes. Cool cake slightly before serving.